Our daily TPS reports suggest one piece of work-appropriate attire in a range of prices. We begin the week in splurge mode, with our most expensive suggestions, and wind our way to Friday, where a less expensive item of clothing might be just what you need to make it to the weekend. Happy Monday! Not so happy? Perhaps you feel like you’ve been kicked in the head already? Yeah, us too. But, good news! This is a four day work-week! Woo hoo! Still, you’re going to need sustenance to make it through the week, and we suggest this little ditty, to your right. 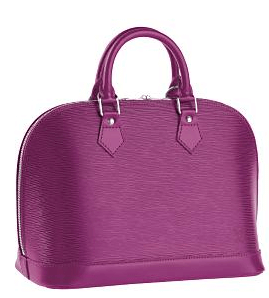 Louis Vuitton bags have long been classic; the Alma bag is particularly favored among business women. Made of durable and luxurious Epi leather; it’s large enough to fit all your technology, a large paperback, a huge sunglasses case, and more. This season they have two limited edition colors, Grenade (at right) and a darker purple, Cassis. We’re sure both would be surprisingly versatile — after all, what can’t you wear purple with? Available at Eluxury.com for $1,240. Louis Vuitton – Epi Leather Alma – Grenade.